Are you thinking about installing a multi-stage whole house water filtration system to improve the health and well being of your family and home? Discover the 9 essential buying tips for purchasing one of the most important appliances you will ever install in your home. A whole home water purification system connects directly to the main water line to your home purifying water for showers, laundry, faucets, and toilets. A plumbing professional can easily take care of the proper installation of your unit. 1. Finding the right system to purify your homes water. There are many types and brands of whole house water filters. The kind you’ll need will depend on the types of impurities in your water supply. If you are on a city water supply you will want a whole house filter that will remove toxic disinfecting chemicals like chlorine, chloramine, and bromine. You may also want to eliminate sediment and hardness. If you live in a rural area and have a private well, you probably have problems with sediment, iron, and hardness and would need a well water filter designed to take care of those problems. You may also be dealing with run-off from farm chemicals like nitrates, pesticides, and weed killers as well. 2. Find out what impurities are in your water. Your best bet is to have your water tested using a quality water testing service, which will determine the whole house water filter that will best suit your needs. Most city utilities will provide a basic analysis free of charge. If you have a well you’ll probably need an independent lab to run a comprehensive water test for you. You can also contact your county to find out what contaminants are typically found in your area. 3. Do you have high amounts of sediment in your water? If sediment is a big problem you will need a whole house sediment filter. Multiple water sediment filters are the best way to go, starting with a 30-micron sediment filter and progressing to a 5-micron unit. This will give you an effective, high-quality filter system to deal with any sediment problems you may have. It’s best if you purchase reusable sediment filters, which will save you a considerable amount of money in the long run. which is pretty much the case these days, you will need a more sophisticated system. Most chemical contaminants can be removed with a granular activated carbon filter. Activated carbon is one of the most effective materials for removing chlorine, the most common chemical found in municipal water supplies. In fact, it will remove over ninety-nine percent of the chlorine, along with hundreds of other chemical contaminants, all of which are extremely toxic and harmful to your health. causing stains on your plumbing fixtures. Iron can be removed with a high-quality sediment filter, if it’s in the form of rust. If it’s dissolved iron, you will need an ion exchange filter or an iron filter to remove it. Your water analysis report will tell you what type of iron you have. 6. Does the filtration system have an adequate water flow rate? Another important element you’ll want to consider is the flow rate, which is how much water will travel through your home’s filter in one minute. The best whole house filters will have a flow rate of at least 7 gallons per minute to maintain uninterrupted adequate pressure during your home’s highest usage times. You will want to get the right sized unit for the number of people in your household as well as the size of your home and number of bathrooms to get the proper flow rate. So the larger the filtration system, the longer it will last, the better flow rate it will have, and the greater the pressure it will allow. 7. Is the system NSF certified? Be absolutely certain the filtration system you are looking at is NSF certified as an entire unit. This cannot be stressed enough. This is a rigorous and costly certification that only a select few whole house filter manufacturers have put their systems through. This certification assure you that you are getting exactly what you are paying for when buying your home filtration system. Many filter manufacturers make claims about their unproven products with nothing to substantiate these claims. The components of these untested filters have been NSF certified, but the unit as a completed product has not been tested. You have no guarantee that these untested and non-certified filtration systems will meet the performance criteria they are suggesting. Make sure to check out the whole house water filter reviews and comparison charts to find a system for your home that not only has all of the components NSF certified, but the system as a whole unit has been NSF certified as well. 8. Does the unit require back flushing? Look for a water filtration system that doesn’t need to be back flushed. Eliminating this process will save you money in the long run from possible breakdown of the electrical components required for back flushing and excess water being washed down the drain. Again, take a look at the whole house water filter reviews and comparison charts to find a system that doesn’t require back flushing. 9. Buying online has its benefits. One of the benefits of buying your unit online is the ability to compare prices and systems very quickly. You can check multiple sites at a time to see what they offer and at what price. You can also check warranties and return policies, in case you’re not satisfied with the product. Customer reviews will describe the experiences of other customers with various products. Plus you won’t have to waste gas driving all over town try to find what you’re looking for. In many instances, you might not have to pay tax, and the shipping could be free depending on how much you purchase. 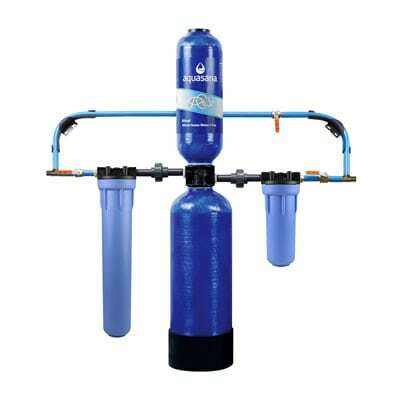 Paying attention to these important details when shopping for a whole house water filter online, or anywhere for that matter, will not only help buy the right purification system for your home and protect your investment, it will also give you the peace of mind that comes with knowing that you have the highest quality water you and your family need for your health and well-being. Do yourself a favor and purchase the best whole house water filter you can afford for your home today.